Up until the 19th century, the dominant form of painting in France was "academic art", the traditional idiom taught at the Ecole des Beaux Arts and promoted by the French Academy. Academic art was tightly regulated, both as to theme and execution, and was ranked according to the hierarchy of the genres. During the 19th century the system was challenged by an increasing number of painters, especially Realist artists like Millet, Gustave Courbet (1819-77), Honore Daumier (1808-79) and others. This clash came about because Realist painting focused on modern issues such as social conditions, rural poverty and the lives of the common people, whereas the academic system did not consider such mundane subjects to be worthy of representation. Millet's particular specialty was peasant life, and he is best known for a series of works highlighting the plight of the peasantry and the harsh physicality of their daily lives. These works include: The Sower (1850), The Gleaners (1857), The Angelus (1857-9) and Man with a Hoe (1862). For more about French Realism, see Gustave Courbet's more political works, including: A Burial at Ornans (1850) and The Artist's Studio (1855). For later developments, see: Realism to Impressionism (c.1830-1900). The most important school of rural French painting during the middle of the nineteenth century was the Barbizon School, close to Fontainebleau, which was an informal group of artists whose members included Millet, Camille Corot (1796-1875), Theodore Rousseau (1812-67), Charles Daubigny (1817-78), Narcisse Diaz de la Pena (1808-1876) and Jules Dupre (1811-89). Initially inspired by Naturalism, the group shifted towards Realism around 1850. The Gleaners - now seen as a pioneering work of modern art - is a perfect example of Millet's profound respect for the timeless dignity of human labour. (Note: 'Gleaning' describes the activity of collecting leftover corn and other crops from farmer's fields after the harvest.) It depicts three peasant women each involved in one of the three aspects of gleaning: searching for ears of corn, picking them up and tying them together in a sheaf. The task was backbreaking but made an important contribution to the diet of rural workers, and was one of the main tasks undertaken by French peasants at the time. Millet himself spent almost a decade researching the process. The painting's focus on the lowest ranks of rural society attracted considerable opposition from the upper classes, who were upset by its artistic pretentiousness and its social radicalism, and linked it with the growing Socialist movement. It was however accepted for display at the annual Salon of the Academy. Furthermore, it was greatly admired by French republicans for its dignified and realistic appreciation of the rural poor. Millet paid close attention to its composition, using every device to imbue his subjects with a simple but monumental grandeur. The angled light of the setting sun accentuates the sculptural quality of the gleaners, while their set expressions and thick, heavy features tend to emphasize the burdensome nature of their work. Furthermore, these figures, bent double and toiling in the darkened foreground, are set against a warm pastoral background scene of harvesters - with their haystacks, cart and sheaves of wheat - reaping a rich harvest in the corn fields. The contrast between abundance and scarcity, and between light and shadow, is cleverly used by Millet to emphasize the class divide. And the remoteness of the landlord class is also highlighted by the blurry image of the landlord's foreman, sitting on a horse in the remote distance (right). The entire composition is in fact a commentary on the social classes of France and, in particular, on the inability of the lower classes to rise above their station. The three women are shown bent over, so they do not pierce the horizon, confirming that what we are born into is where we stay. Meanwhile, the uppermost line of ground is occupied by peasant farmers watched over by the foreman, none of whom break the horizon either. The sky symbolizes the unattainable upper class of society that looks down on its inferiors. It is as different from the other people as air is to earth. But there is a sign that change is coming. The white vest and red and blue hats of the gleaners form the three colours of the Tricolour - the flag of the French Republic and the symbol of popular Revolution in France - as captured for instance in Liberty Leading the People (1830) by Delacroix. 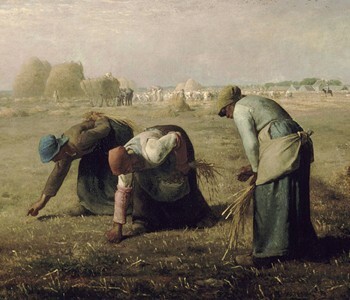 The Gleaners is one of Millet's greatest genre paintings and inspired a tradition of modern genre works. See, for instance: The Floor Scrapers (Floor Planers) (1875) by Caillebotte; Roadmenders in the Rue de Berne (1878) by Manet; Women Ironing (1884) by Degas; The Potato-Eaters (1885) by Van Gogh; and Man Smoking a Pipe (1890-2) by Cezanne. Millet sold The Gleaners for a paltry 3,000 francs (roughly $600). In 1889, the painting, then owned by the banker Ferdinand Bischoffsheim, was sold for 300,000 francs ($60,000) at auction. Soon afterwards it was donated to the Louvre, and in 1986 was transferred to the Musee d'Orsay.  For analysis of other Barbizon genre paintings, see: Homepage.